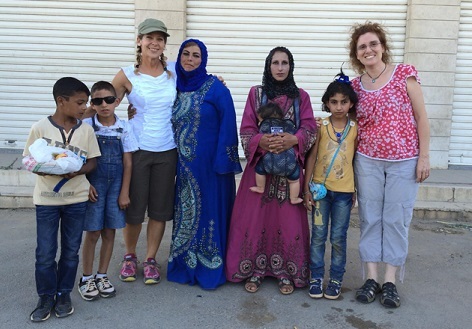 EYE: What got you involved with this humanitarian cause of bringing soup to Syrian refugees? BARBARA: The idea of the cookbook came before the soup distribution actually. I was in my apartment in Beirut and I was freezing cold. I had put the heater on and still, I was so cold. 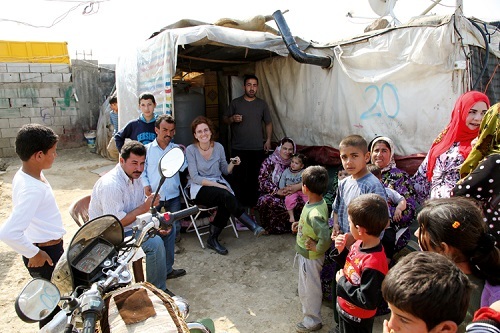 That night I couldn’t sleep thinking about refugee families in the Bekaa Valley sleeping in their tents 40 miles away. How were they able to beat the winter cold? I shouldn’t be complaining, I thought to myself. How can they survive? I was really worried. We heard on television of children dying because of the cold. I couldn’t go on with my life and ignore theirs. During Mass on Sunday, a friend of mine who works at the United Nations told me about a campsite nearby and gave me the contact of a person I could call. This is what I did. 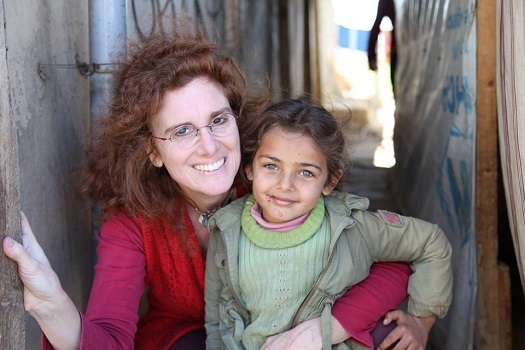 I went to visit the refugee camp, not really knowing what to expect or what one could do to help. But my visit brought me closer to the problem and inspired me to find a way to ease someone’s pain. This is when I started taking photos of the refugees and talking to them about food. 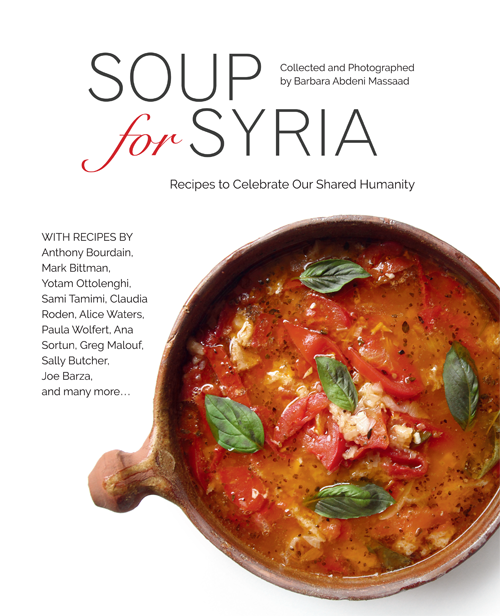 EYE: Did you ever think it would turn into this book, Soup for Syria? BARBARA: I am a cookbook writer and photographer so it was natural for me to do that. Week after week, the idea came about to do a humanitarian cookbook. A very good friend of mine called me one day (she was also very concerned about the current situation in the camps) stating that she wanted to make soups for the refugees. EYE: Why is providing warm soup so important? Why soup? BARBARA: Soup is comfort. Soup is home. Soup is nourishing. I have always had a special feeling for soup. When I was a little girl, I would tell my dad soup warms my heart. It’s like a security blanket for the body and the soul. EYE: What do you hope to accomplish with this project? BARBARA: Awareness that we are all in the same boat. We all have basic needs. Families are suffering; we can’t just live our lives and let them live their hell. We can’t ignore the pain of others. EYE: Is this interest in humanitarian issues something that has been your passion for a long time or has it been developing? BARBARA: I can’t just watch people suffer and do nothing. I have empathy and am very sensitive to children’s suffering. I am a mother of three children. EYE: You live in Lebanon and we read where you get criticized for not helping Lebanese children in the same way you are helping the children of Syria. How do you deal with that criticism? BARBARA: It hurts a lot, especially when it comes from friends whom I have known forever, and then I discover that they don’t understand my point of view. They are parents, too, and yet have no empathy for this cause. It alienates me from my surrounding. EYE: You and your publisher Michel Moushabeck were able to attract more than 80 celebrity chefs and cookbook authors to give you recipes. Was that difficult? BARBARA: Actually, it was not. We had great enthusiasm from almost everyone we approached. We are both very dynamic and worked really hard to make this happen. EYE: Talk to us about your eye for photography. What do you look for when photographing your subjects? What did you see in the eyes of the people especially the children? BARBARA: I am the daughter of a well-known photographer. Photography was always a part of my life, food, too! When someone is sensitive, photography comes easily. I have the ability to put people at ease and succeed to get them to trust me —that is 80% of a photo. EYE: Tell us about a favorite soup that you prepare. Can we have the link to that recipe for our readers? 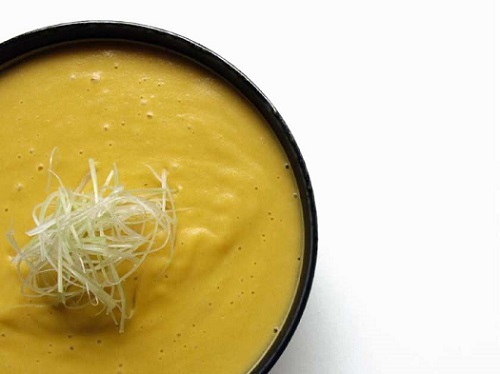 BARBARA: This article with soup recipes appeared in the Montreal Gazette recently, and I simply love this roasted pumpkin soup recipe. You all have to try it. EYE: What have you learned from this experience? BARBARA: I learned humility. I learned to accept everyone regardless of any negative stereotype. I learned that war is never a solution to any problem and that the ones who pay for war are innocent victims, mostly women and children. 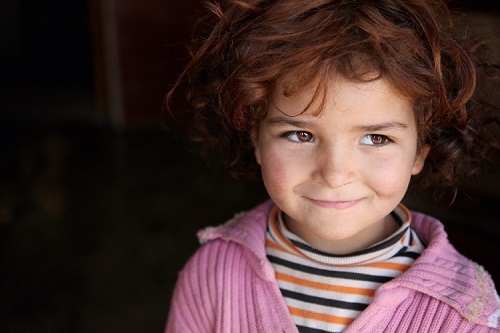 EYE: Can you describe the resilience of the Syrian refugees that you have met? BARBARA: The situation is very hard to accept. I visited the camps yesterday, and instead of being immune to the situation after two years of visiting them, it is affecting me more. A 15-year-old girl had an operation, and because of the donation of an angel who has empathy, we were able to help out. I visited her as she was just coming out of the operation and what I saw was my own daughter lying on this hospital bed weak and confused. She looked at me. It made me cry. People, there is so much to do, so much pain. There is so much injustice. I repeat again and again we are all in the same boat, all looking for the same basic needs. No, I can’t get used to this situation where families live in terrible living conditions year after year. 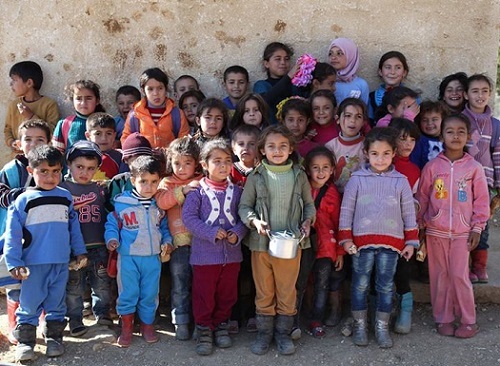 EYE: Is “Soup for Syria” a model that could be duplicated to help others in similar situations? BARBARA: Yes, of course. It is basically a way to give comfort to those who suffer by offering food relief, understanding and a clear message to the world. EYE: Do you think of yourself in terms of a modern day crusader for a cause you believe in? BARBARA: I think of myself as a mother who knows what it is like to have a family and to want to protect that family. In turn, this is what drives me the most —children and families suffering for the injustices of war. To get a program like this established, it takes empathy and an open mind with simple ideas. EYE: What advice would you give others who want to accomplish projects like this? BARBARA: I would tell them that it is possible to accomplish any project once you put your heart and soul into it. Many people discouraged me to undertake this project, but I did not listen and luckily was able to make a difference somehow. EYE: How did you decide where to give the profits from the book? BARBARA: It was a joint decision taken by my publisher and me. A contract was drawn out and the most important factor for me was to have the money used for a food fund relief for Syrian refugees. EYE: What’s next for you? Will you continue with this project? BARBARA: I will continue to collect donations, goods, buy food and help those who need hospital fees paid. If I can help in any way, I will be doing it. Of course, it’s not me alone but all the people who were involved in this project who make it happen. Each one contributed greatly to the success of the book and project. EYE: Thank you, Barbara. 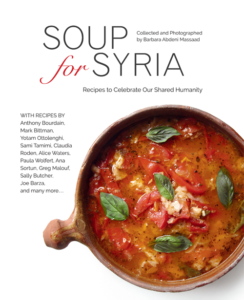 We admire your care and concern for these refugees and want to let our readers know that if they want information on ways they might get involved, they can go to your Soup for Syria website.